Reema Khan has lately been on a buzz-building spree. Her movie with Shaan Shahid is apparently in the works, while last month she was spotted celebrating son Azlaan’s birthday party. And who can forget her physical tiff with long time rival Meera – who has generated much curiosity with her upcoming “Baaji”. Our visit to Al-Aqsa Masjid (the 3rd holiest site in Islam) and Dome of the Rock. (27th RAJAB – SHAB E MAIRAJ) Thank ALLAH for the opportunity to visit Al-Aqsa Mosque last month and pray inside the Dome of the Rock –from where our last Prophet Hazrat Muhammad (PBUH) ascended to heaven on Shab-e-Mairaj. We also prayed at the place where before the ascension, Prophet Muhammad (PBUH) led the prayer which was followed by one lac, 24,000 prophets. The journey to the heaven was accompanied by Hazrat Jibrael (AS) and Prophet Muhammad (PBUH) met many prophets at each stage of the heaven including Hazrat Ibrahim (AS) and Hazrat Adam (AS). That night Prophet Muhammad (PBUH) saw several miracles from God and was instructed to have Muslims pray and fast. Initially, he was ordained 50 times a day prayers but Hazrat Musa (AS) advised that it was too much for the Ummah, and so Prophet went back and eventually came back with the 5 times a day prayer that we are supposed to do. This was a lifetime opportunity and we cannot but thank God-Almighty for this “Saadat”. Also, feel indebted to our friend who arranged it all. Jerusalem is not only very holy to us – Muslims, but also is a very holy place for the monotheist religions of the world. Unlike, what we see in pictures and the calendars -the Golden Dome which is used as an emblem of whenever Jerusalem or Al Aqsa Mosque is mentioned, are in fact two separate structures standing across from each other and within the outer walls of the huge compound. 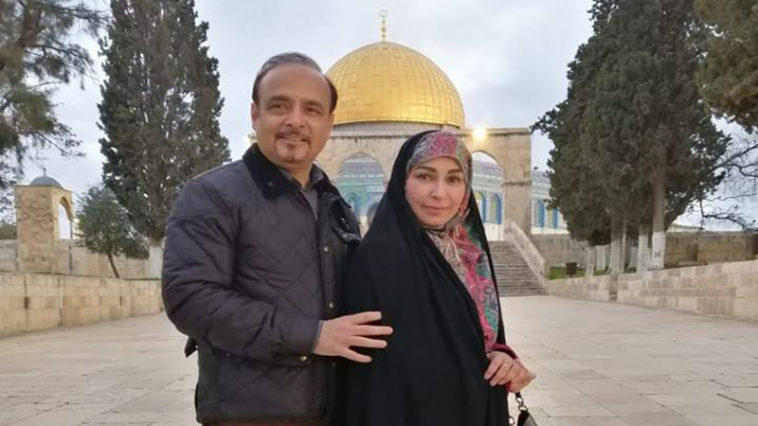 We were fortunate to pray inside Al-Aqsa mosque and also very lucky to go inside the Dome and see the “Rock” – on which we believe, our last Prophet Muhammad (PBUH), ascended to heaven on the 27th day of the Islamic month of Rajab. Rajab is the 7th month of Islamic Calendar and 27th of Rajab is being observed today this year. Reema also met the mosque’s mufti and posed for pictures which she posted on her instagram account.